(5% DISCOUNT THRU 6-28-19) Building on the success of the original "Ragtime Wizardry," Volume 2 features 18 more of today's top ragtime pianist-composers playing their own works in exclusive recordings made just for this special collection. The result is an entertaining and wonderfully diverse sampling of ragtime piano in the 21st century. While some of the compositions are firmly rooted in the structure and harmonic language of Scott Joplin, Joseph Lamb, and their contemporaries, others draw inspiration from novelty piano, stride, rock, folk, classical, and other idioms. Each is infused with the distinct voice of its composer. From the exuberant "Bomba Walk" to the melancholic "Allegheny Rag" to the folksy "Brazos," as publisher John Stark might say, here is ragtime that is different! 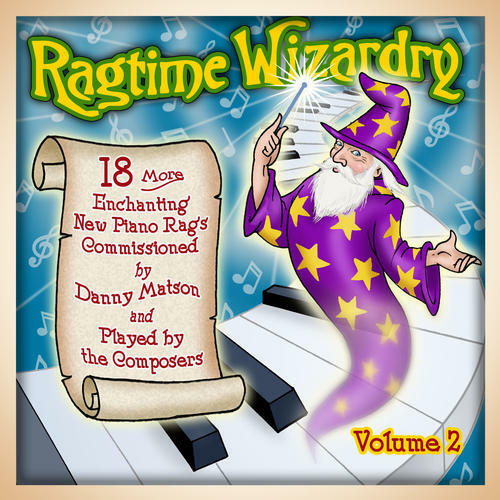 "Ragtime Wizardry, Volume 2" brings together many of today's most popular ragtime pianists and composers from around the world: Tom Roberts, Jack Rummel, Ethan Uslan, Fred Hoeptner, Glenn Jenks, Tom Brier, Jack Bradshaw, Jacob Adams, Charlie Judkins, Michael Chisholm, Will Perkins, David Cavalari, Matthew Gillespie, Andrew Barrett, Dale Hadley, Kylan deGhetaldi, Michael Winstanley, Edward Maraga, and Domingo Mancuello. The CD package includes a handsome 24-page booklet with full program notes and biographies of each of the composers. 18 tracks. 68 minutes.